We've been so busy, I'm not exactly sure where to start! Instead of doing individual updates, I'll try to just do one big update, so bear with me! In December we took the kids to the Moscow Ballet's Nutcracker. I'm a huge fan of giving them as many experiences as I can, and was so glad we were able to go. All the kids really loved it, especially the girls. In hind-sight I should have told them the story before we got there, as there were no words so they were a bit confused, but they loved it anyhow. It was fun dressing up fancy and going together. My aunt treated us to a bike ride to look at lights and that was a lot of fun. The girls loved shouting "Merry Christmas" at everyone, and definitely spread Christmas cheer. Conner had a lot of fun as well, and really loved the whole house decorated with cats. We also went to the Reed Park Zoo to look at their zoo lights display with another homeschooling family from our Church that we enjoy hanging out with (they have 3 boys, so Conner is in Heaven when we are with them). The kids loved the lights, and Pokémon was by far Conner's favorite. The girls preferred the carousel, though they loved the lights too. The week before Christmas we did a quick turn-around trip to see my Nephew before Christmas. We met him at the LEGOLAND Discovery center and tried that out for the first time. They have a few rides, some guided builds, a 4D movie, as well as some free-build themed areas. We had a lot of fun and I know we will be back. Deena loved her first Christmas home. It was so full of excitement and wonder for her. I loved watching her eyes light up with each tradition she participated in. I made sure to order a few adoption and India ornaments for her so that she had ornaments on the tree as well. She loved decorating the tree and also loved sitting by it. She would carefully touch each ornament, and asking for the story behind them. We went to Phoenix for Christmas this year, so we celebrated as a family early. We totally blew the Christmas budget (like blasted it right out of the water.... thank goodness for Christmas sales) and got the girls each their own Fisher Price Wild Thing ride-on toy. They are hand-powered and such fun toys. They LOVE them! The road by our house is very rough, so there's not much they are able to ride on out there, as it's too rough for wheelchairs or plasma cars. They LOVE riding their bikes (now to get Deena one too! ), but want to go far in them of course because they go FAST, so these give them something to play in the front yard with. It works great on a bit of a rougher terrain so it's a great option for them. Conner got a hoverboard for something to play outside with too. They are the happiest kiddos on the block! They are also the only kiddos on the block, but I know they would be the happiest regardless. Every time they are on them they just giggle and giggle. It makes every penny worth it! We enjoyed our time in Phoenix with family and the kids loved celebrating Christmas so many times. Madi had a seizure after the holidays, which was a bummer. We were hoping her new medication would stop her from having more. When we had tested her levels, though, they were on the low side, so we increased her dosage with hopes that her seizures will finally be under control. We took her to the ER after her seizure, just to be on the safe side, but thankfully she had come out of it at home with her rescue meds and oxygen. She probably didn't need to go to the ER, but her teeth kept chattering and we wanted to be extra sure she was done seizing since we had maxed our her rescue med dosage at home. We weren't there long, and she didn't need blood tests or anything, so that was good. Once we got home she came down with a fever and threw up multiple times, so I think she was just coming down with the flu. She doesn't normally have seizures with the flu, but she likes to keep us guessing :). We are praying this is her last one! On January 2nd we celebrated Deena's first year home. She chose Indian food to celebrate and had requsted idli, which our normal go-to Indian restaurants don't carry. Thanks to Google we found a great little family-owned restaurant/store with authentic food that makes both idli and dosa. She was in Heaven and really enjoyed herself. I can't believe she's already been home a year. She has adjusted so well and is such a sweet, loving, and smart girl. I'm so thankful that she is ours! Conner's birthday was a few days after Deena's adoption day. We took the family to the Pima Air and Space Museum for a space shuttle model build, then went out to Oregano's pizza for some gluten-free yumminess. He also had a friend spend the night and it was the perfect day. Because the fun never ends, 3 days after Conner's birthday we celebrated Deena's 9th birthday. This was her second birthday home, as she came home the day before her 8th birthday last year. This year she was SO excited for her birthday. She wanted to go back to the Indian food restaurant we had found, so back we went. I think we have found her new favorite place for sure. She ate idli, dosa, AND naan, in addition to sambar and chicken tikki masala. She left with a big smile and a very full tummy. Deena had another PAM infusion, which she gets quarterly. We are so thankful that she is able to get them in our home and that we have been blessed with amazing nurses who get her IV quickly. She does so great with the infusions and we love that we can help make her bones a bit stronger. I decided to take a day off of homeschooling and take the kids to the Children's Museum for a few hours since we hadn't been there yet. A few hours turned in to the entire day, but they were having so much fun I didn't want to tear them away. We went ahead and purchased a membership, since it was almost the cost as a one-day trip for us anyhow. It's a small museum but it's not too far away and it's well done. They are anxious to go back and play some more. We had some good friends, the Thompsons, come visit and spend the night with us. We have been missing our dinners and time with them and it was SO nice to relax and have their company. The hardest thing about moving has been being away from friends and family. It does all of our hearts good when we have company. A few weeks later we had a visit from Kyla, our friend and unofficially adopted teenager (that's now an adult), who lived with us for a year before Ramya came home. She is like family to us and the kiddos really loved having her here for a weekend. 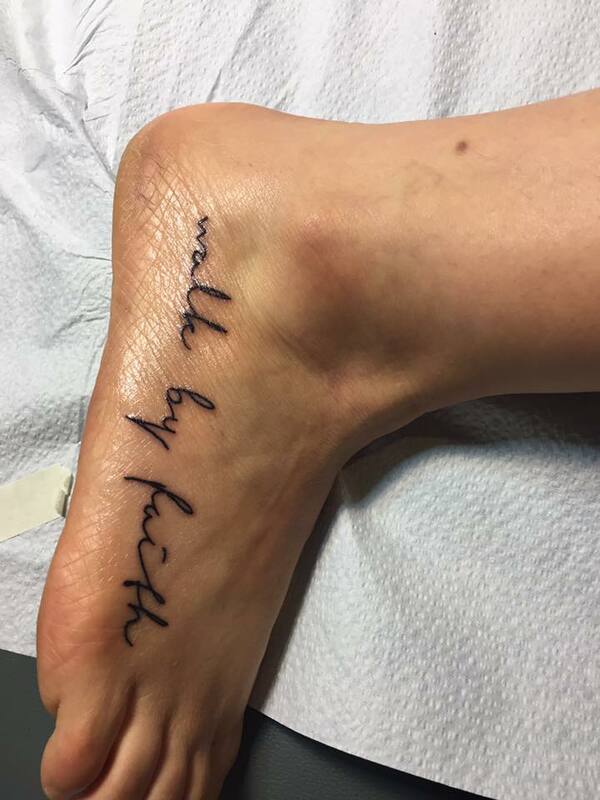 I had told her if she came to visit I'd take her to get a few tattoos she's been wanting. I decided to also get the one I have been wanting for a while. We went to Jay at Sanctity tattoo, as he was recommended by the pastor of our Church and I know he does a great job. I got "walk by faith" tattooed on my right foot. I often think about how different our lives would have looked had we listened to what the world told us to do, instead of walking by faith and following God's plans for our family. Our greatest blessings have come from stepping out in to the (often scary) unknown and trusting that God would see us through. It's not an easy thing to do; something I fail at on a regular basis, but it's a blessed journey indeed. I love how it came out, it's exactly what I was envisioning. Conner and Deena wanted a combined friend party and asked to go to Build-a-Bear with their Tucson friends. Since it's so costly there, it worked out great because it was less kiddos. Costco also had a special around Christmas where you got $100 at Build-a-Bear for $70, so that came in handy. 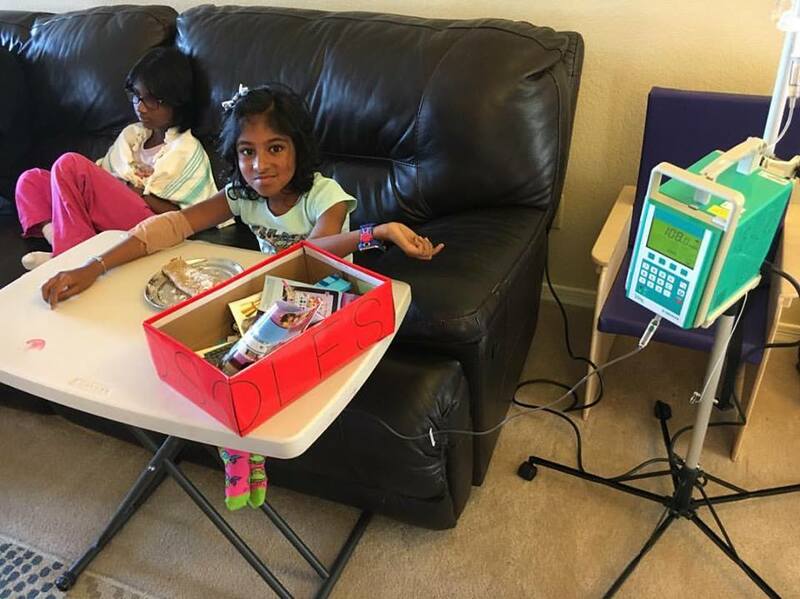 All of the celebrations, combined with the cost of Deena's surgery and Christmas has been a LOT lately. I'll gladly take any money off I can get! Deena really enjoyed having a real party this year and was on cloud 9 the entire time. Conner said it was his best birthday yet. We also watched a Star Wars movie, ate pizza, and had ice cream sundaes. Last week we had 3 appointments in Phoenix, so we also celebrated Conner, Deena, and my nephew's birthdays with family. We just had a simple family lunch at the park, but it was fun. My sister-in-law makes the most amazing cakes and the kids loved them. We also had a piñata and, hey, who doesn't love a piñata?!?!? 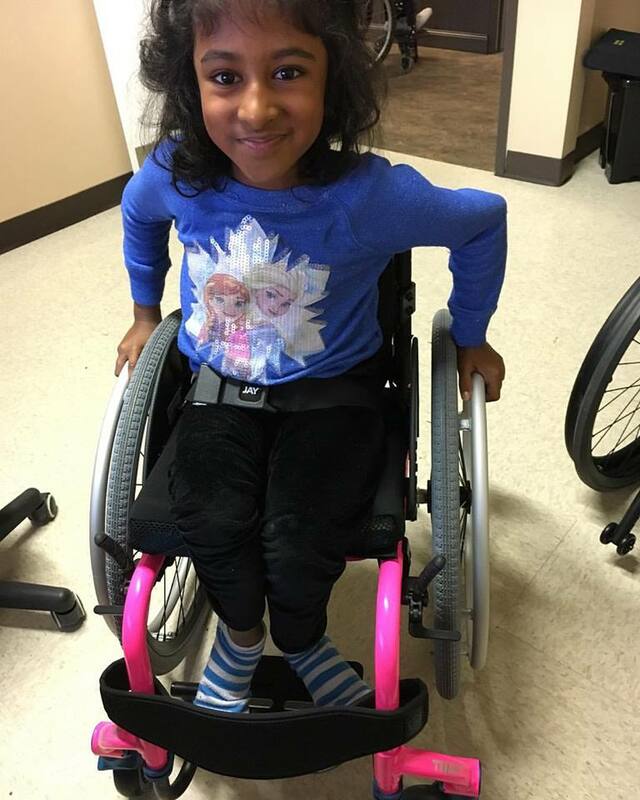 Yesterday Deena's first new-to-her wheelchair came in. She loves it! 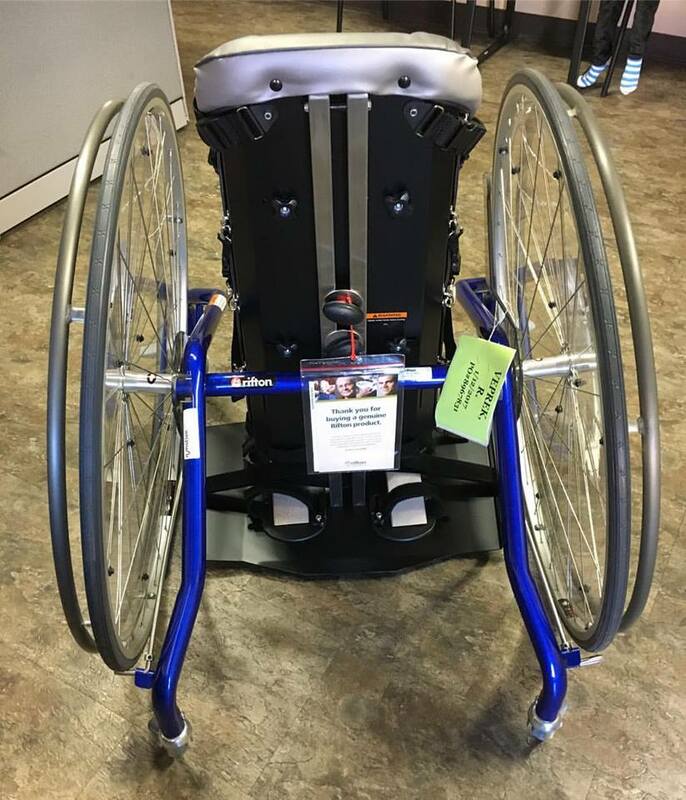 Ramya's new Rifton Mobile stander also came in. It's really big, but should fit her ok for now, and it gives her lots of room to grow. It doesn't fit through some of our doorways in the house, which I hadn't though about, but it will work great for using during homeschool, in the kitchen, etc... I love that the girls can be up and weight-bearing, but can also have independence and mobility. Our Rifton mobile standers are probably one of my favorite pieces of equipment for the girls. As an added bonus, Deena fits great in Ramya's old Rabbit stander, so all 3 girls will officially have a mobile stander to use. I think that's about it for the fun "stuff". Other than that, we've been chugging along with our therapies and appointments. We took a break from vision therapy because Ramya was too overloaded and needed a break. We are still doing her exercises at home and are continuing to monitor her. So far she is continuing to make improvements but has been less anxious, so that's been big. Between too many therapies, the holidays, and Deena's surgery, she's been regressing and struggling a lot. We are trying to be very intentional about rocking her and spending time with her, and she also has an attachment therapist that's been helping us work through things. She got to take a month off of feeding therapy because she was doing well, so that's HUGE! She's regressed with her eating again, but not nearly like it was before, so we are thankful for those improvements. She hasn't gained the weight she lost back, but she hasn't lost any more. We also have a naturopathic doctor helping us with some natural supplements and things to help with her anxiety. To celebrate her eating, the feeding therapist came to the house and we made brownies together. She had fun and it was nice to have a positive celebration in relation to her eating, since it's been a struggle for her since, well, before she even came home.